At Protection Dogs Plus, we believe every man, woman and child has the right to be safe in their homes and communities. 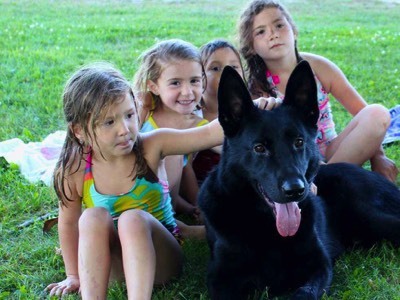 Our personal protection dogs will defend that right for your family. we offer personal protection dogs as an accessible and effective means of deterring any threat. In other words, your protection dog is with you when law enforcement, alarms and firearms are not. More likely to be targets of crime. Over 4 times more likely to be raped. Almost twice as likely to be victims of aggravated assault, and 8 times more likely to be victims of simple assault. Three times more likely to become victims of stalking (victims generally know the perpetrator). In addition, we were shocked to learn that most female murder victims are killed by someone they know; often times a spouse or partner (or former spouse or partner). In order to create a training program that provides our most vulnerable clients with peace of mind and state of the art protection, our female clients and staff members have given us valuable input about what they want and need from a personal protection dog. Protection Dogs Plus is a family business; we train the dogs in our own home with our own young children. For example, when we delivered Hans to his new family in Idaho, we were able to transfer full handler control to their young daughters. You’ll get a glimpse at the training process in the video. Our dogs go through every conceivable temperament test; we don’t leave anything to chance. We hand select dogs with loving personalities, and we never assume that our dogs would turn the other cheek when a toddler pulls a tail or smacks the head. We carefully supervise our dogs with children to be sure parents never have to worry about leaving their kids alone with their companion. We make sure everyone in your family, including your children, are completely comfortable and happy with your dog. Our Protection Dogs Plus questionnaire will help us to match your family with the ideal dog. This also helps us to customize the training specifically for your family’s needs.Your personal protection dog will learn to follow your lead — even if you’ve never owned a dog before.You don’t have to be a dog trainer to handle our protection dogs. From the language of their commands to the exact tones of your speaking voice, we tailor the training for you. By the end of the delivery, anyone in your family can handle one of our fully trained personal protection dogs. You’ll understand powerful dog-training principles that allow you to both enjoy and maintain your dog’s obedience, companionship and protection training.Let us know what you’re looking for in the best protection dog for your family.